Published on September 30, 2014 September 30, 2014 by Proud Mama of Four! We are so blessed; so thankful for all of your support, prayers, kind words and generosity!!! This part of our journey is proving harder emotionally and financially than I could have ever imagined…it’s only the beginning. Barely even a week has gone by here in Toronto and already Abbigail has been through so much…too much. Upon admission, her UTI was discovered to be resistant to her current antibiotics, a change was made to her meds but that didn’t change the fact that her OMS was already running rampage in her body and to her brain. She was experiencing coordination and balance challenges as well as ataxia. These symptoms were somewhat alleviated as the days passed on IV antibiotics and Abbigail was able to play with her new friend and fellow transplant buddy! On top of her OMS, Abbigail’s CVL (implanted line for IV) was not working and had to be x-rayed before fate decided she required a new line and it was pulled out during a fall on our routine morning walk through the halls. On top of these issues, we were told we were being discharged to Ronald McDonald with oral antibiotics until her UTI is dealt with. Sounds great right!?! Not really. This means that Abbigail has just “forfeited” her transplant spot at SickKids, the very place where the one and only phisician who accepted Abbigail’s case practices. For Abbigail this could be life altering. 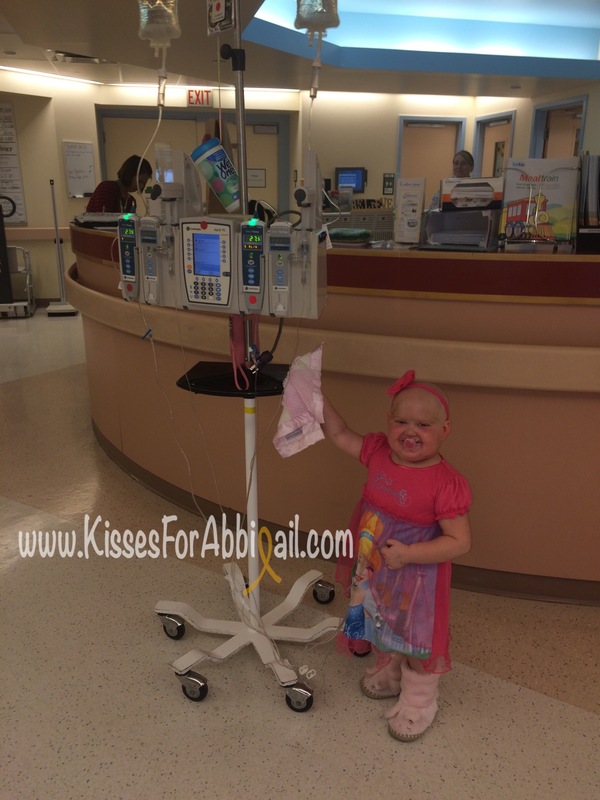 We have not only uprooted and made huge changes to our family’s life, but Abbigail has no more options. This is experimental however it is all we’ve got and Matthew and I pushed through and fought long and hard to find someone who would help us! Now we may lose this opportunity right now. This is a tough thing to swallow after all that she has been through and all that she will face if she does not get this chance. I am trying to enjoy this time alone with Abbigail, make her happy and do things she loves while we can but we both miss Matthew and the boys and our family and I have a hard time not running scenarios through my mind constantly as we walk past all of the cancer hospitals, research bulletins and buildings downtown. We have some appointments scheduled this week and hope to hear from her doctor tomorrow regarding surgery, but in the meantime we will keep our blessings in sight and focus on them. Please help me pray. Please help me beg! Our baby girl needs this and she needs this now. Hello! I have been following Abbigail’s journey for months, but only recently realized that we have a connection! I am an EA for the RCCDSB and work with Shelley Montgomery at St. Anthony’s Catholic School in Chalk River. We have been praying for Abbigail at SAC! And we will continue to. Keep the faith…I can’t even begin to imagine what you, as a family, are going through. But you are all strong. Just take care and know that there are lots of prayers, good wishes and happy thoughts being sent your way. Thank you so much for your ongoing support and please thank everyone at St Anthony’s for our family too!